Mouse anti Guinea pig CD45 antibody, clone IH-1 (MCA1130) used for the evaluation of CD45 expression on cultured bone marrow derived mesenchymal stem cells by flow cytometry. From: Tura-Ceide O, Lobo B, Paul T, Puig-Pey R, Coll-Bonfill N, García-Lucio J, Smolders V, Blanco I, Barberà JA, Peinado VI. 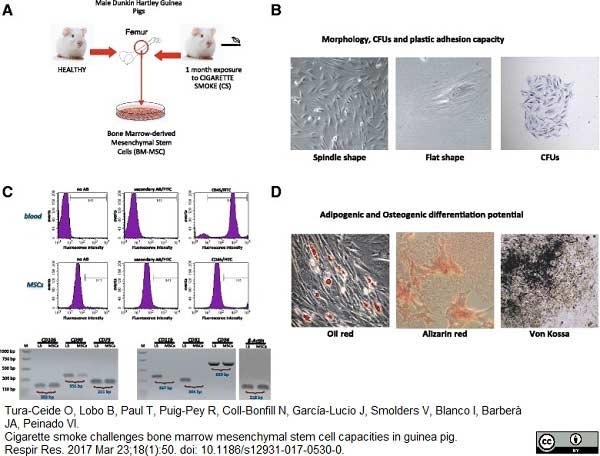 Cigarette smoke challenges bone marrow mesenchymal stem cell capacities in guinea pig. Respir Res. 2017 Mar 23;18(1):50. Mouse anti Guinea Pig CD45 antibody, clone IH-1 reacts with CD45 on all leucocytes. Mouse anti Guinea Pig CD45 antibody, clone IH-1 immunoprecipitates proteins of M.Wt. 220,000, 210,000 and 195,000 and 180,000 from lymph node lymphocytes and proteins of M.Wt 195,000, 180,000 and 170,000 from thymocytes. Guinea pig leukemic B lymphocyte L2C cells. Hart, I.J. et al. (1992) Subpopulations of guinea-pig T lymphocytes defined by isoforms of the leucocyte common antigen. Tura-Ceide, O. et al. (2017) Cigarette smoke challenges bone marrow mesenchymal stem cell capacities in guinea pig. Respir Res. 18 (1): 50. Ishikawa, M. et al. (2017) Transplantation of neurons derived from human iPS cells cultured on collagen matrix into guinea-pig cochleae. J Tissue Eng Regen Med. 11 (6): 1766-78.